With pork joints hitting the headlines today, I thought I’d finally get round to posting about how to stretch a large piece of pig across multiple meals, rather than wasting it on a single bizarre initiation ceremony (allegedly). 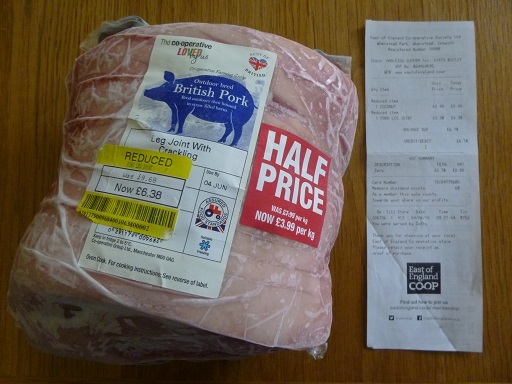 Back in June, I spotted a leg of pork in the reduced section of our local Co-op which was such a bargain that it broke my resolve to stop food shopping during the storecupboard challenge (post here). At £6.38 for 2.5kg, it was huge enough to feed lots of people, so I hoarded it in our freezer until a couple of families came round for lunch. Lots of pork! With crackling too! And it should have been nearly £20! With six adults and four children to feed, I’d originally planned a barbecue, until a hideous weather forecast scrapped that plan. The enormous leg of pork became a handy Plan B. After defrosting the joint over night, I took it out of the fridge and removed all the plastic packaging. The recipes I read gave mixed messages about whether or not to remove the string before cooking. I left it on, but reckon that was the wrong choice. Turns out attempting to remove cooked in string from crunchy crackling, while still maintaining polite conversation, is not easy. Anyway, I had a go at the following advice on how to make decent crackling. This involved bunging the joint on a plate in the sink, pouring over some boiling water, draining away the water, and then repeating with more boiling water three minutes later. The skin was already scored ready for crackling, but I made a few extra cuts for luck (NB: you need a hideously sharp knife or it’ll just bounce off). Apparently the pork should be really dry before cooking, so I wiped the joint with some kitchen towel and left it for an hour. Overnight would apparently be better, but I didn’t have any nights left. Just before cooking, I massaged some salt into the skin. Then I sliced up some onions, put them in the bottom of a roasting tin, added the pork joint on top, and bunged the whole lot in a really hot oven for half an hour. Roasting time depends on the weight of the meat. Pork seems to take 35 minutes per pound. My 2.5kg joint equates to just over 5 and a half pounds, so the cooking time was roughly 3 and a quarter hours. After the first half hour at a really hot temperature, I cooked it for the remaining 2 and three quarter hours at a lower temperature (AGA translation: moved it down from the top to the bottom of the roasting oven, still on a shelf though). After putting the pork to one side, wrapped in foil and then tea towels to keep it warm while resting, I attempted some gravy. I put the roasting pan on the hob, added enormous quantities of wine and a tablespoon of flour, boiled away madly and then sieved it into a jug. It was not a success. I fell back on Knorr chicken gravy pots and frantic whisking with boiling water. Apple sauce, made by peeling, coring and chopping three apples, then heating them in a saucepan with a couple of teaspoons of sugar and 50ml of water, was much more successful. Just keep an eye on the apples, stir every so often, and add extra water if they look like sticking to the bottom of the pan. I served the roast pork, apple sauce and gravy with broccoli and cauliflower cheese, boiled carrots, chippolata sausages for any roast refusers, and mashed potato. I would have liked to do roast potatoes, but figured the Aga would keel over and die if asked to remain hot enough to roast potatoes on top of roast pork, broccoli & cauliflower cheese and roasted plums for pudding. Never mind the Aga, I needed a little lie down after cooking all that lot. Loads of leftovers, but all the crackling got swiped. Cold roast pork, seved in brown rolls with mango chutney, plus a bit of cucumber and tomato if you have it handy, are FABULOUS. We ate these rolls that evening, to avoid further cooking, and for a couple of packed lunches too. So good I started eating before remembering to take a photo. Inspired by this recipe over at the English Kitchen, pie seemed the only possible option faced with leftover pork, gravy, apple sauce, puff pastry and a handy onion. We even had leftover mashed potato to serve with it. To give the remains of our roast pork a fitting send off, I even went out and bought a Pyrex pie dish and pie funnel from one of our local charity shops (post here). I started by chopping up an onion, heating it with a bit of oil in a frying pan until soft, and then bunging in the chopped up remnants of the pork. Chopped onion and roast pork. Oooh the excitement. While the onion was softening, I rolled out my 180g leftover puff pastry on a floured surface until it was roughly the same size as the top of the pie dish. I put the pork and onion mix in the pie dish around the pie funnel and added the leftover successful gravy, leftover apple sauce and 75ml of water. I rubbed a bit of butter round the rim of the pie dish, in an attempt to make the pastry stick over the top. I put the rolled up pastry over the top, trimmed off any pastry hanging over the edge of the dish, used a fork to press the pastry down onto the butter and made a couple of cuts to let the top of the pie funnel poke through. I also brushed the top of the pastry with a bit of milk, in the hope it would go brown. Think I left the pie in a hot oven for about half an hour, while heating up the left over mash and cooking some broccoli and cabbage. My husband and I ate the pie with mashed potato and steamed broccoli and cabbage. It was even more fabulous than the roast pork rolls. A good pie is a thing of beauty, even if it doesn’t photograph well. Now I still scope out the reduced section in the Co-op, hoping for another pork joint, haunted by memories of roasts, rolls and pies past. In the meantime, I still need to find a decent recipe for gravy. What was wrong with your gravy? I'd have added the flour first, to make a roux, and then added the wine. If you make it like white sauce, you shouldn't need to sieve it. My two secret ingredients are Marmite for umami (even Marmite-haters will like it- I have 3 and they all love the gravy) and either ketchup or jelly (as in strained jam, not cubes of Rowntree) or even jam. You want something with a little sweetness and a bit of flavour. I make plum and rosemary jelly and apple and mint jelly most years, and they go with most meats, but just plain apple jelly is good, and that's much more versatile (on toast, in sandwiches, with meat, as a glaze, diluted with hot water to drink), and ketchup works too. You could even add a bit of jam, though I think I'd go with plum or similar rather than strawberry or raspberry. Blackberry would be nice too, I think. Like the sound of adding Marmite and jelly/ketchup when making gravy. Will persevere! I'm drooling over the photo of the roast pork I love crackling. You've made excellent use of that joint. Thank you. I don't usually cook large pieces of meat but we really enjoyed this one. Gravy is so easy to make! Just take the roast out of the pan, put the pan on the top of the cooker on a middle heat burner. Add water ( you will learn to judge how much…less is better than more!) and stir until all of the bits and juices are mixed in with the water. Then mix regular flour into a shaker of water and shake well to mix into a lump free, pourable mixture, and slowly add to your gravy, stirring as you add. It we'll thicken, which is when you STOP adding. Too much makes it a lumpy mess that tastes of flour! Good luck..keep practicing! Oh dear 'lumpy mess with flour' does sound suspiciously like my gravy. I must try your suggestion of mixing the flour and water together before adding to the pan.